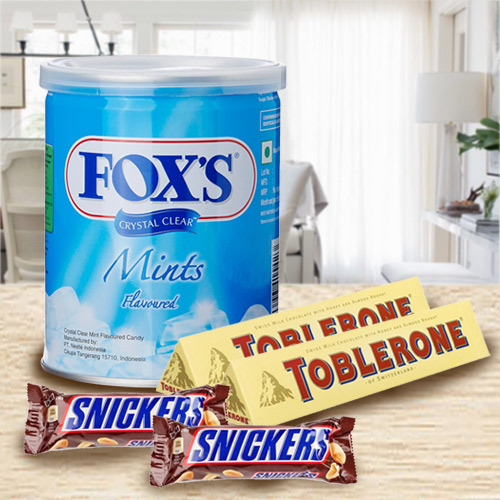 Imported Chocolate Hamper containing Fox candies (180 gms), 2 Imported Snickers (57 gms each) and 2 Imported Toblerone Bars (50 gms each). Send this Diwali Gift Anywhere in India. This special Diwali Gift will make your loved ones feel happy. Flowers Delivery Shantiniketan, Send sweets Sri Ganganagar, Wedding Cake Nagpur, Diwali Mithai Durg, Send Flowers and Gifts to Pimpri, Online Shop Jaipur, Flower to Agartala, New Year Flowers Bharatpur , Fresh Fruits Madurai, Send Gift Miraz, Dry Fruits to Agartala, Birthday Delivery Vadodara, Sending to Sonipat, Flower shop Gulbarga, Panvel Online Cake Delivery.